Embarking on a renovation for your kitchen at home, or having a kitchen in your business given a makeover can be a challenging project, thanks to the seemingly endless array of choices you’ll have to make, trades you’ll have to manage and deadlines you’ll need to juggle. Having an experienced plumber on hand can help enormously, especially one who can help you navigate all the different design and construction options you will have. A residential kitchen renovation can be a considerable investment, however a well-designed and constructed kitchen can not only add thousands of dollars onto the value of your property, but it can create a beautiful and fully functional space. A newly installed commercial kitchen can also help to make your business more efficient, whether it’s a kitchen for staff or an integral part of your operations. Plumbing that’s been thoughtfully planned and professionally installed is at the heart of every great kitchen. Renovating a kitchen can sometimes be easier than building from scratch, generally because you know what worked and what didn’t work in the original kitchen, and you can build on this knowledge to make a better version. Designing the plumbing for a kitchen renovation generally involves discussing the requirements for the new plan, scoping the existing kitchen on site, and getting a feel for the pipework, position of grease traps in commercial settings and current fixtures and fittings. Depending on the size and complexity of the renovation, all plumbing may need to be disconnected and moved to different locations. As it can involve the removal of wall linings and even sections of flooring, this can be an expensive and time consuming exercise, so careful planning is critical to ensuring you don’t exceed your budget or your deadline. If you’re updating your kitchen to newer and more efficient fixtures, fittings and appliances, then these will need to be sourced before any work can be started. Many of the latest kitchen appliances and fixtures can come with different plumbing requirements, meaning you’ll need to ensure your plumber understands what is needed when it comes to installation. Because of the considerable cost involved, as well as the time it can take, getting a kitchen renovation right the first time is critical. We’re often called to fix kitchen upgrades or complete renovations that have either run over budget and need to be saved, or have undergone poor planning or construction. Luckily these issues can be resolved, but it’s always best to avoid having to start over. The following are some of the mistakes that people often make when starting a residential or commercial kitchen renovation project. 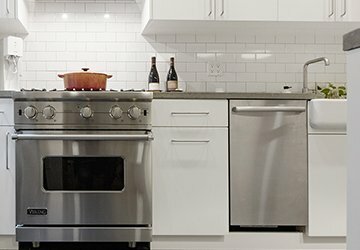 While it may seem like a good way to save money at the time, trying to project manage a kitchen renovation yourself can end in disaster. This is because of all the ‘moving parts’ that are necessary in the planning and construction phases, as well as the professional know how you’ll need. If you’re not going to hire a full time project or site manager for the job, generally it’s a good idea to get the plumbers on site to help you manage and liaise with the rest of the trades. This is because the plumbers and gas fitters will be an integral part of the renovation’s schedule, and will need to organise their time and their movements carefully. The time pressures on businesses can be intense, and having a working kitchen down and out of action for any length of time can seriously affect your bottom line. When you’re having a new commercial kitchen built, it’s tempting to rush the design and just hope that it all works out in the end. However, more often than not, you’ll end up trying to save time, only to cause yourself serious headaches down the track. Take your time, and get the advice of an experienced commercial kitchen plumber early on in the design process. This can help to focus your ideas and give you a sounding board to help you avoid any nasty mistakes in the future. We’ve worked with residential and business owners in Perth on their kitchen renovations for more than 10 years. 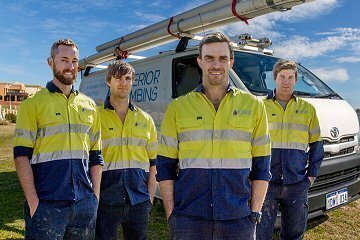 Our fully licensed and qualified plumbers and gas fitters provide high end workmanship and the very best in customer care. We also offer a 100% money back guarantee on all of our kitchen plumbing services. So contact us today, and talk to one of our friendly staff about your next kitchen renovation.